As a large washing machine factory in Berlin closes down, Wildcat examine the history of the plant, and the manufacturing of household appliances in Germany as a whole. How quickly things change. It was only 40 years ago that major household appliances were mass-produced in Western Europe, but there are already few factories left and most have been shut down or relocated. It’s nothing new that almost entire branches go abroad. What is new is that no new branches arise which hire significant numbers of people. Between 1990 and 2003 roughly 330,000 jobs were relocated from Germany to Eastern Europe. This was around 25,000 per year. Through the worldwide relocation of production, Germany loses up to 50,000 jobs each year. With around 38 million employees in Germany this is a little more than 0.1 percent a year. In comparison, the little cyclical boom in the year 2000 increased employment by 700,000. The first washing machines, refrigerators and stoves were produced as industrial mass-products in Italy for the (West-)European market in the late 50s and early 60s. Before the 70s, companies which were limited to “their” national market were more productive than afterwards, when all of them had to expand. They were threatened by companies which tried to compensate massive class struggles in production with aggressive price competition. As a result Bosch/Siemens (BSH=Bosch Siemens Hausgeräte) became a “cheap Jack”, churning out low-grade products at discount prices. In the second half of the 80s the factory in Berlin/Spandau (Hausgerätewerk Berlin, HWB) had to deal with product return rates of 15 per cent and a similar degree of sick leave. We often wrote about struggles in this factory in Wildcat, and some of us had worked there. Now this factory is supposed to be closing. More people work in industry in Germany than in the most developed capitalist countries. 27 percent of German employees worked in industry in 2003, five percentage points above the numbers in France and ten percent above the numbers in Great Britain; in the USA even less people work in industry. This is the fundamental reason why Germany has always been the export world champion. But like elsewhere in Europe in Germany the numbers sunk steadily in the past 15 years (in 1992 it was 35 percent). In the German electrical industry the amount of employees sunk in the past 15 years by about one fifth (1991 1,087,331; 1993 980,000 with less than 74,000 in East-Germany; by June 2005 less than 810,000). But the electrical industry means everything from the production of a hair dryer to a generating plant. More important are the movements in between the generic term “electrical industry”. For example the relocation of consumer electronics had already started to take place in the 70s and 80s, during the heyday of the major household appliance. Today conventional telephones, small household appliances like mixers, and consumer electronics in general are no longer produced in Germany. The rationalization in household appliance production in the second half of the 80s and the increasing internationalisation and concentration of the sector since the 90s lead to the steady decline of jobs in Germany (in the beginning of the 90s the turnover was getting higher, since then that too has sunk). The production of washing machines in Germany increased from 1.6 million pieces in 1982 to 2.8 million in 1992 (record rates during the re-unification boom). Between 1987 and 1989 US companies got into the European production of household appliance, for example Whirlpool had taken over Phillips and Bauknecht. In the beginning of the 90s Bosch/Siemens had bought Spanish and Turkish household appliance producers. After that Electrolux took over Italian companies and AEG in Germany and has since been the world market-leader. BSH is number three in the world ranking (worldwide 34,000 employees, 14,000 still in Germany; 16,000 three years ago) and makes more than three-quarter of its turnover (of 6.8 billion Euro) abroad. Of the 42 factories, seven are still in Germany, the others in Spain, Greece, Latin America, USA, Poland, China and Turkey. In the last few years Turkey has become probably the most important location for production of major household appliances in the world. In 2002 the Turkish Arcelik group took over Blomberg (the last German producer of household appliance except Miele), two years later Blomberg stopped the production of washing machines in Germany. Miele too, which had marketed its expensive products with the label “Made in Germany”, is going to get rid of every tenth employee of the 11,000 in Germany until 2007. The core segments of the household appliance sector have being shifted (i.e. for 15 years there has been no development in cooling units and no big progresses are expected; the lowering of consumer prices, the increase of laundry and the shift to electronic control was for washing machines a key development in the last few years, in the future there will be only gradually advances). 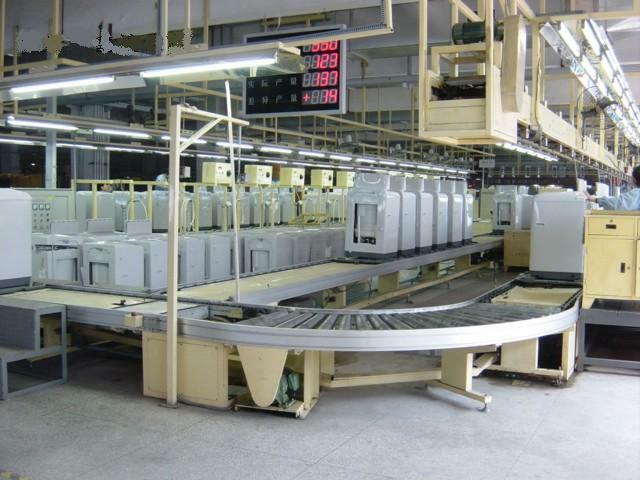 What happened with electrical goods in Germany is now taking place in the production of top loader washing machines; in about two years no top loader will be produced in Germany anymore. It happened in France with the production of refrigerators, in 1960 there were 20 producers of refrigerators, in 1967 only Thomson-Brandt was left, and since 1993 no refrigerators are produced in France anymore. Except the Miele factory in Gütersloh there are only three and a half washing machine production locations in Germany: Bauknecht in Schorndorf - “threatened”; AEG in Nürnberg - “threatened”; Bosch/Siemens in Berlin and Nauen close to Berlin. The plant in Berlin is supposed to be closed by the end of 2006. Officially the plant in Nauen is suppose to produce the new generation of washing machines, but it has been made known that doubts exist over the continued existence of Nauen as a location for production. The decision “for Nauen” depends on the increase of subsidies through the provincial government in Brandenburg. In the production of household appliances in the last 40 years the typical mass-production worker compassion was employed: unskilled assembly workers who were hired from rural areas. Maybe one forth were women, up to 90 per cent migrant workers. This reservoir of labor is exhausted in Western Europe. Significantly no workers with Turkish descent of the third generation are working at Hausgerätewerk Berlin. For them this kind of work is completely uninteresting. The employer is able to get a little time advantage when they build factories in rural areas with high unemployment rates in Eastern Europe. But these areas are in industrially shaped regions. The situation they are attempting to escape appears quickly. In general the employers are looking to leave those regions in 10 to 15 years, when the wages will be “too high” or no “appropriate labor” will be available. In general the employers make the “cost pressure” responsible for relocation. In 1992 40 per cent of all washing machines sold in Germany cost less than 600 Euros, by 2004 it was over 80 per cent! In 1987 1300 DM represented the average delivery price of a washing machine in Germany, in Italy it was 580 DM. Correspondingly in Germany in 1987 there was 12.3 billion DM worth of major household appliance in Italy, in it was Italy only 7.3 billion but Italy produced double the amount of washing machines than Germany (in Germany over two million, one third of those in HWB!). Not many people pay these high prices: firstly because “cheap brands” like Eko and LG deliver almost the same quality, and secondly because the German brands lost their leadership in technology (they had it with ecological criteria but they didn’t develop new ones). In the past years this development was aggravated, because of sinking wages and shrinking domestic markets in Germany. There is no “national protection for brands through label oriented behavior of consumers anymore”, not only because of the processes of industrialization in Turkey, but also because of increasing single-households and increasing rates of divorces: a washing machine is no longer a long term purchase. From 1960 to 1980 the amount of employees working in electrical plants in West Berlin halved to 66,000. But it was still the biggest branch in West Berlin. After re-unification and after the decline of the “re-unification boom” a clear structural change of industry in Berlin begun. In May 1992 the whole of Berlin had 223,000 industrial employees; this was less than 21.4 per cent a year before, in April 1993 only 152,900. The developments lead to a strong increase of the unemployment rate. Since January 1992 the Western part of Berlin has the highest unemployment rate of former West Germany. For about 50 years washing machines were produced in Berlin/Spandau, at first little units together with other household appliances. With the acquisition of the Constructa Company and the amalgamation of Bosch and Siemens in 1966, they began to produce only washing machines in Berlin/Spandau. In the mid 70’s 2,100 workers produced 450,000 machines a year. In the mid 90’s 2,500 workers produced more than one million washing machines and more than 200,000 tumble- dryers. The increase in unit-production took place in the 80’s: from 600,000 devices in 1982 up to one million in 1986. The units of washing machines and dryers produced per year per worker doubled from 1978 to 1988 (from 205 to 442). In the beginning of 1987 young second-generation Turkish workers organised a slowdown strike against the steady rise in unit-quotas at the assembly line. They did this so well that that the employer couldn’t enforce the new quotas, not even with foremen, spare men, snitches and forced transfers of workers around the factory. After a while the workers even reduced the quota. Finally they agreed on more spare men at the line. The workers learned a great deal during their struggle, they could flip the cooperation at the line at their will. When they had idle time during reorganisation they could force their ideas about how many machines they wanted to produce. Since fall 1987 they didn’t need to protest against legally obligatory overtime: they just subtracted the machines they had produced in overtime the days after from the “normal units”. “If we wanted to, we just reduced the units anytime”. At this time the vanguards of the struggles became, in their own words, “professional saboteurs”. More and more machines had scratches, planned or “just because” (it was possible to buy such machines on a discount at the factory-shop). Once the early shift came to work and every single machine was scratched. Now and then the line stood still because of sabotage of the “robots” or because of a cut drive belt. Despite the fact that a spare man (a worker who replaces other workers when there is a problem) supervised the drive belt it was sometimes broken three times a day. “Then they put a security guard at the line for three weeks, he was walking around the belt. He had to listen to a lot of stuff from the workers! But it didn’t help. They just didn’t understand how we did it.” At late shift the spare man had to stay until every worker left the factory. Nothing worked. In spite of repeated transfers of the suspects, nothing helped. The management never tried to raise the quotas at this line; instead they transferred the workers through the whole factory. In 1992 they decreased production. In the three years which followed more than 1000 workers left the factory, mostly with very good compensation payment. Since the mid 60s the HGW in Berlin was now and then an object of investigation for industrial sociologists and work scientists. In the end one had the impression that they became desperate: all attempts at “humanization”, “team-work”, and all of those buzzwords failed. Today when a system of team-work rules the line which largely corresponds to those dreams of the work scientists, the plant is in line for closure. This is an article from Wildcat no. 74, summer 2005.